No matter how you look at it, the Tesla Model S is a bargain, or at the very least will offer performance a gasoline car does for roughly the same price. How so? Follow my thinking. You have a choice to get a high performance gasoline or an electric car with limited range. What will you choose? If you want performance, you pay for it. Regardless of electricity or gasoline, you pay for performance. A Ferrari and a Porsche cost what they do because there is a lot of engineering that goes into them. Range is never an important feature with these cars. It’s as simple as that. Exotic Range & The Myth. If you buy an exotic car, chances are you will never give range a second thought. After all, depending on the way you drive, gasoline or electricity range is only as relevant as how much you ask from your car and at $50 to 75,000 and beyond... who care? To complicate things further, we can push a Prius and lower its MPG to that of a regular gasoline car. We can also drive a Ferrari California, or a Porsche 911 frugally and achieve impressive MPG. In either cases, you have the choice with either cars to favor the fun factor, or range. EVs Disrupt The Norms. This is where Tesla’s bold choice to go after performance and give a choice completely disrupts the quid pro quo in the automobile industry. The Model S shows an EV sedan can match and even beat a gasoline “performance” in terms of handling. See our interview: A Tesla Model S Owner's Adventure Will Make You Want To Own One. And if the Roadster can thumb its nose at most high-performance cars with regular laptop batteries while not designed for an electric drivetrain, how much better would be a sedan be if it was built with an electric motor from the start? The Price Point. Let’s take a $100,000 sedan from mainstream gasoline manufacturers. Chances are most of you have no idea what their range is, nor could you know because it all depends on how you drive the car. Now let’s take a Tesla Model S at the same price. The car will match the range of an equivalent gasoline car, you get a tax rebate, it handles very well, uses home made energy cheaper than the international fossil fuel you buy and is minimal in the maintenance department. Yet, range is what most naysayer bark about when it comes to electric vehicles, EV but gasoline cars. What’s wrong with a car that allows you to trade in range for price? Pay Less For Range, Or More. 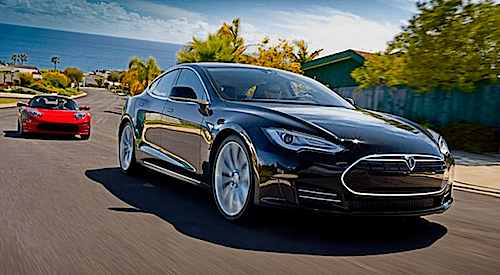 When we stop to consider that in 8 years Tesla Motors was able to fully develop, build and produce an electric sedan that can go toe to toe with the best at a similar price, what is there not to like the choice of three range versions? This is where the game change muddles the water. There isn’t that much performance difference between the entry level Model S 40 kWh pack, the 60 and 85 besides range considering the higher battery packs pack more performance negating any weight increase. The handling is the same. This is something most traditional gasoline carmakers can’t seem to match at this moment, you either buy a BMW M3 of the not as exciting base version that don’t have the same roll stock with its dumbed down driving experience. This is something Tesla understands, choice with the same overall performance. While Tesla Motors isn’t perfect, it does one thing very well, showing us that with a little creativity, you can make regular modern battery technology exceed even the best gasoline cars for the same price. On top of it, the choice that comes at a price is range, which for many isn’t a problem. Fancy buying a Porsche or a Ferrari with only 200 mile range? It doesn’t exist. When even Motor Trend gets it, there must be something about these electric cars. The Model S is the car that changes the game and should get the most stubborn person to think about that maybe, just maybe there might be something about these cars after all. Now consider this: the average mortgage in the U.S. is $167,500 and the average income is $32,000 per year (before taxes). Now figure out how that pays for a $100k car.. There are reasons that a top-dollar sports car or sedan are rare and not the norm. Aaron, if someone is silly enough to get a hefty mortgage for a house owned by a bank, why would they buy a $100,000 car? My case was for the $50,000 base version that matches that of a performance gasoline car. In essence, those who can afford that, and that is the point of the article have no problem taking off the range anxiety blinders because they simply don't care. In this aspect, the Model S changes the game a lot. If I trade off 100 theoretical miles for less money, I'm sure a lot will consider it, especially if that is less in maintenance and fuel. Now if you're talking about a people's car, than get a Smart EV of i MiEV. They're both under $20,000 after incentives. Except you didn't.. "The Price Point. Let’s take a $100,000 sedan from mainstream gasoline manufacturers. Chances are most of you have no idea what their range is, nor could you know because it all depends on how you drive the car. Now let’s take a Tesla Model S at the same price." Yes, you're righ, I should have reworded it to Price vs Range. That would have been more correct. The point was that people who spend $50K or 100 don't care about range. They also don't suffer from taking house loans they couldn't afford in the first place. If now, these people have access to this, it means in a few years more will have the same access. It's always been like this. First early adopters who can afford it, then the rest.